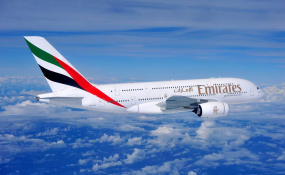 Emirates Airlines has started offering popular Nigerian films and music on its award-winning in-flight entertainment, ice which has of over 4,000 channels of on-demand. In the new package, customers can enjoy the highly celebrated Nollywood movie 'Lara and the beat' which was premiered in 2018. They can also look forward to other movies from Nigeria and West Africa such as Mr. Not So Perfect, Ghanaian's Bad luck Joe, Azali, and My Very Ghanaian Wedding, and Cameroon's 'Ward Zee and A man for the weekend'. Amongst its wide music offering, customers can look forward to Nigerian and African beats including Davido's Son of Mercy-EP, Burna Boy's Outside, King Aiyeoba's 1000 can die, Wizkid and Fela Anikulapo Kuti's playlists, amongst others. Ensuring passengers' comfort on board its flights, Emirates said the airline, now offers passengers the choice to make their entertainment playlist before they fly.